If you’d force me to do a list of my all-time-Shitkatapult Top 5 NONE OF THEM by Lars FENIN would be one of the first titles I count in. This outstanding track of his double album GROUNDED in 2005 assembles the best of two music worlds: reggae and techno. The songwriting by FENIN combined with the voice of GORBI still gives me goosebumps - and to the people I played it, too, at home or on the floor. ROBAG WRUHME and the WIGHNOMY BROTHERS charted it for a long time as number one on their dj charts and we all knew that this track had to be included into FENIN´s upcoming MIXES & MAXIS album. 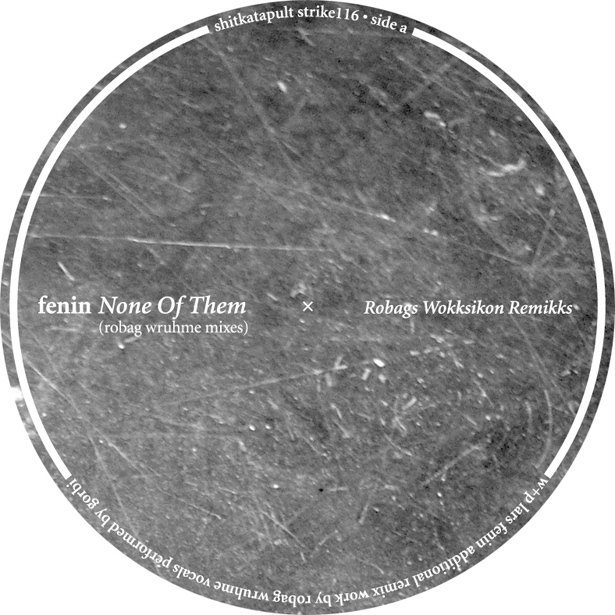 Here now, we have the 12” featuring NONE OF THEM in a floor killer remix by ROBAG WRUHME and a dub remix version on the flip side.